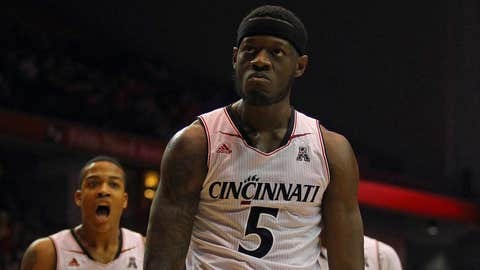 Cincinnati has matched its best start during coach Mick Cronin's eight seasons and is cruising along behind one of the nation's top defenses. Cincinnati has matched its best start during coach Mick Cronin’s eight seasons and is cruising along behind one of the nation’s top defenses. The 19th-ranked Bearcats appear to have a solid chance of stifling another opponent when they go for a 10th straight win Saturday against host South Florida, which ranks last in the American Athletic Conference in scoring. The Bearcats (16-2, 5-0) moved into the Top 25 for the first time this season Monday and beat visiting Temple 69-58 the following night behind another dominant defensive performance. 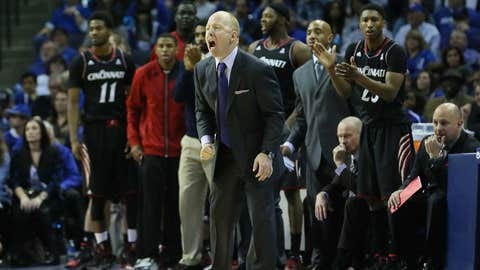 Cincinnati leads the AAC with 56.3 points allowed per game while holding opponents to 38.3 percent shooting. The Bearcats haven’t given up more than 67 points in any game this season and have held the last 25 opponents under 70, the longest active streak in the nation. Tuesday marked the 11th time Cincinnati limited a team to fewer than 60 points, and it improved to 5-0 in conference play for the first time since opening 6-0 in 2002-03 while in Conference USA. Cincinnati leads the series with USF 24-8 but has lost four straight in Tampa. The Bearcats won last year’s meeting 61-53 in overtime, and the Bulls (10-7, 1-3) figure to be hard-pressed to put up points again Saturday. They’re last in the conference with 68.9 points per game and registered a season-low in Wednesday’s 71-54 loss at SMU. However, Cincinnati isn’t much better with an average of 71.4 points. The Bearcats, though, got AAC leading scorer Sean Kilpatrick back on track against Temple. Kilpatrick, averaging 18.6 points, emerged from his 3-point shooting slump by going 6 of 13 from long range en route to a season high-tying 23 points. "Coach was really basically telling us you’ve got to play offense with a lot of confidence, you can’t be afraid to shoot," said Kilpatrick, who shot 4 of 33 from beyond the arc in the five previous games. "That’s something that kept clicking in the back of my mind, ‘Just keep shooting.’"
Cronin knew his senior guard would eventually snap out of his funk. "The guy’s a great shooter," Cronin said. "He’s played major minutes with a lot on his shoulders. As great a player as he is, there’s a lot of great players that go through tough patches in a season. I think it’s unrealistic to think that’s not going to happen." USF has seen its top player struggle as well. Senior forward Victor Rudd, averaging a career-best 15.5 points, shot 2 of 13 and scored a season-low five Wednesday. He’s totaled 14 points on 5-of-23 shooting (21.7 percent) in the Bulls’ last two losses. "It is what it is," coach Stan Heath said. "We’ve just got to work at it and get better. Rudd is a veteran for us. Rudd didn’t have one of his better games. He’s been playing terrific. When he’s not playing at a pretty good level, it makes it even harder for our basketball team." Following this matchup, USF hosts No. 18 Louisville on Wednesday and visits 17th-ranked Memphis on Jan. 26. "This is a huge slate in front of us. These are the monsters right in front of us with Cincinnati, Louisville, Memphis – three of the top teams in the league right away," Heath told the Bulls’ official website. "We’ve got to be able to steal some games and try to really grind and toughen ourselves up."